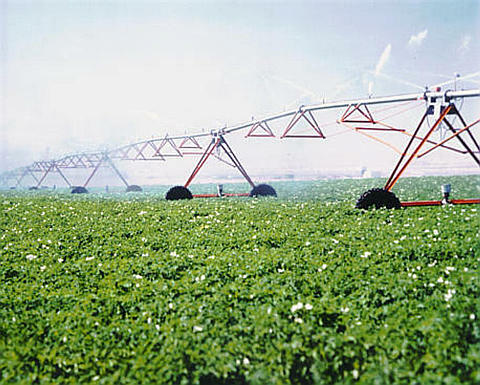 Center-pivot irrigation, also called circle irrigation, is a method of crop irrigation in which equipment rotates around a pivot. A circular area centered on the pivot is irrigated, often creating a circular pattern in crops when viewed from above. Water is drawn up from a well and fed through a tube attached to metal frames. The metal frames are on wheels, and electric motors roll the frames around in a circle, pivoting around the water source, spraying water as they go. Center-pivot irrigation in Railroad Valley, Nevada, USA, as seen by ASTER (17/08/01). Source: NASA/GSFC/MITI/ERSDAC/JAROS and U.S./Japan ASTER Science Team. The system is in use, for example, in parts of the USA, Australia, New Zealand, and also in more arid areas such as the Sahara and the Middle East. Center-pivot irrigation effectively delivers much-needed water to crops in eastern Washington, USA. Photo: Pacific Northwest National Laboratory. Let's have a closer look at the ASTER images on the left. 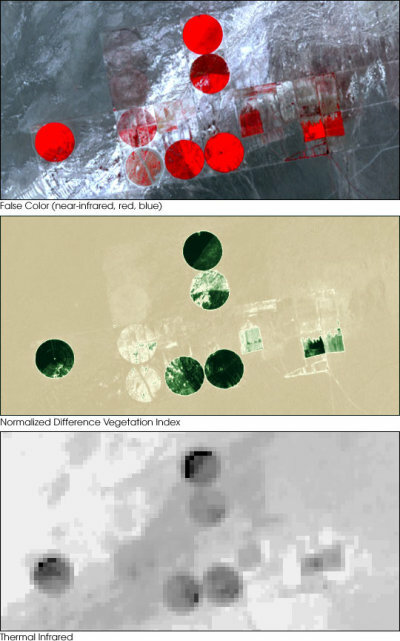 The top false colour image shows center-pivot irrigated fields, with healthy vegetation in red. The middle image displays the NDVI (Normalized Difference Vegetation Index). The colour code shows highest vegetation content in dark green, low vegetation cover in light green and pale yellow, and barren areas in light brown. The bottom image is a thermal infrared channel, with warmer temperatures in white and colder in black. In the thermal image, the northern-most and western-most fields are markedly colder on their northwest areas, even though no differences are seen in the other images. This can be attributed to the presence of excess water, which can lead to crop damage. The combination of information from different bands is a powerful tool to monitor crop health and maintenance procedures.